It’s become a tradition to bake at least on pizza every year on Football Feedings. Pizza is the ultimate canvas to plaster up some food art. This week is the week and we’ve got something special cooked up for ya this time. Kansas State is hosting Oklahoma State so we decided to do up a little thing called Cowboy Frontier Pizza. There’s no campfire involved but there will be some nitrates, that’s for sure. We originally took the recipe over at Southern Plate and did even more cowboy things to it. Guess what we also used their pizza crust recipe. Yes, that’s right, we’ve got a can of BBQ baked beans simmerin’ on the electric grill campfire to serve as our sauce. It’s adventurous but Bush’s seems to think it’s okay. They have talking dogs, though. In large bowl stir together flour, sugar, salt, and yeast until well combined. Pour in water and olive oil. Stir until dough sticks together. Turn dough out onto floured surface and knead for 3-5 minutes, or until it forms a smooth ball. Cover dough ball with plastic wrap and let rise 15-30 minutes, until you are ready to make your pizza. Sprinkle pizza pan with 1/8 cup corn meal. Press dough into pan, spreading as you press, until it reaches almost to the edges of pan. Allow to rest for five minutes. Return to dough and continue pressing until it overhangs the pan all around the edges slightly. Grill chicken on a grill and dice/tear them up. While that’s a cookin’ open up the can of Bush’s Gillin’ Beans and place directly on the grill. When the beans are hot to touch, take them off. 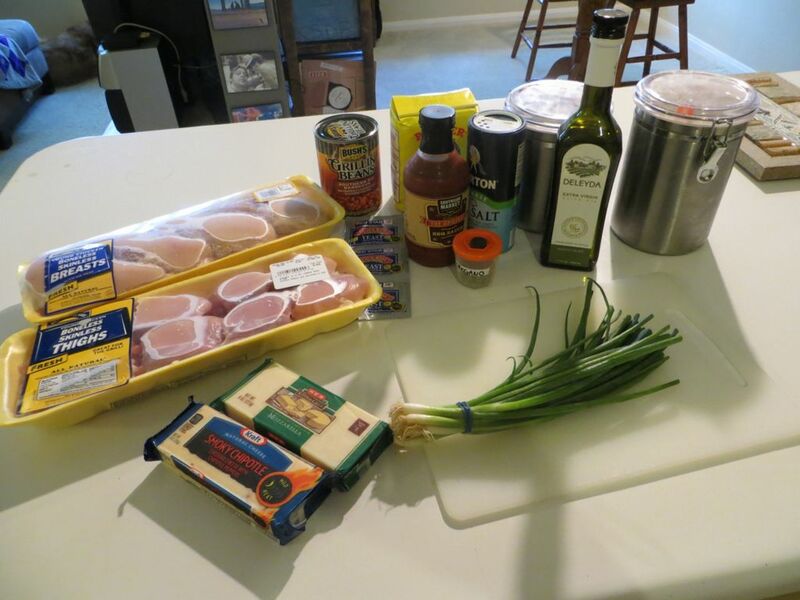 Toss chopped chicken with 4 tablespoons of barbecue sauce to lightly coat. Set aside. Spread remaining barbecue sauce and about a cup of beans over pizza crust (less if you like). Sprinkle with Oregano. Sprinkle with 1/2 of cheese. Add chicken to top of pizza and sprinkle with remaining cheese, followed by onions. Bake in 400 degree oven for 20-25 minutes, or until crust is lightly browned and cheese is bubbly. The pizza came out awesome. We tried a different crust recipe this time and the corn meal at the bottom kept it stick free from the stone. The bbq beans made a surprisingly thick and sweet sauce. 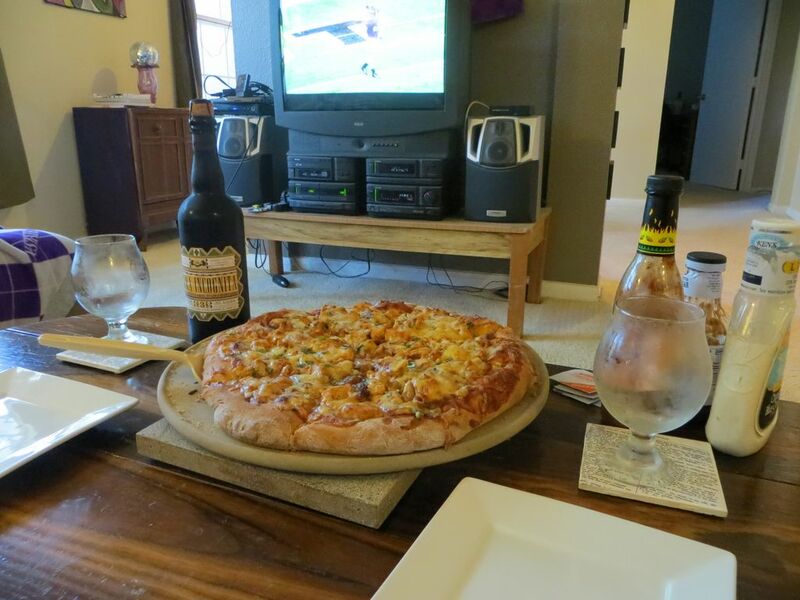 This year’s Terra Incognita wasn’t as spicy, but the mellow malt flavor worked well with the bbq based pizza. You know what? The green onions were a nice touch too. Now on to the games. I saw some of the rout of Georgia by the hands of rival Florida. I also watched some of Air Force vs Army for the Commander in Chief Trophy. The slate was pretty weak. Except maybe for the TCU vs West Virginia game. I saw the beginning at home and the rest at the gym. It was a heart breaker for West Virginia and TCU barely got away to keep the Big 12 lead in the College Football Playoff’s eyes. You know I didn’t watch much of the Kansas State game. Part of it was because they were facing the Oklahoma State and part of it was because Gogol Bordello played last night at Stubb’s BBQ. I did get to watch the first quarter. That first drive was a scare with Tyreek Hill taking hold of the game and scoring a touchdown but it was all Kansas State after that. They got up so quick it really didn’t matter that I watched the rest of the game. It was an up and down day of football watching for me. I had life in between the trickles of football. All in all, the day came away without any disappointments. It helps when Kansas State wins, you eat good food, drink good beer, and see an awesome concert. Maybe going to Fun Fun Fun Fest next week will help out Kansas State when the head to TCU.